June edition of”Inżynieria i Utrzymanie Ruchu” periodical (Engineering and Transport Management) featured an insight about conveyors from AMSORTS Vice President and Technical Manager, Marek Staniewski. Written by Agata Grabowska, it makes an interesting read that we encourage you to read. Conveyors are devices used for internal handling on a given track for specific products, load entities and loose materials. A wide range of conveyors, find their use in many of today’s industries. 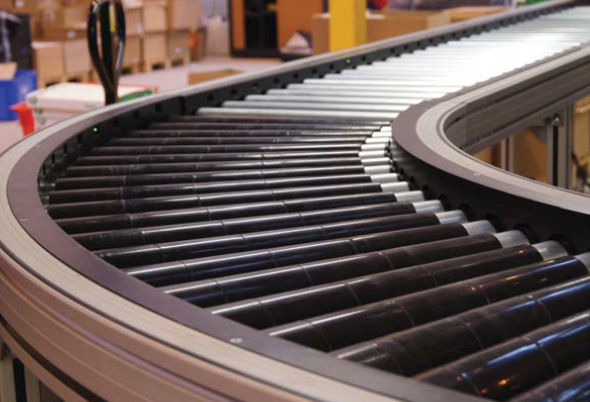 Modern day conveyors are fully automated and characterized with unprecedented reliability, making them a key influential element in the production process, warehousing and product distribution. Work becomes quicker and easier, while production becomes cheaper and more efficient. The range of products, offered through producers and distributors of internal handling shows a variety of conveyors. However, as graph 1 indicates most commonly used are band conveyors (transport by band), next in line are non-band conveyors (transport via mechanical means other than band, through vibrations and gravitational forces) and active medium conveyors (transport using gas and liquid streams). According to surveyed the most popular conveyors for years now, have been Belt Conveyors (96%) especially fixed and portable. These types are mostly used for lightweight products, with small dimensions (loose and granulated, packaged and bagged cargo etc…). They are mostly utilized in warehouses and sorting plants, building sites, technological strings in process and operation of raw materials and mineral resources etc… They can be used as stand alone devices or as elements in an assembly line. Advantages as recognized by users are: modular design, ease of modification, light and modern design made out of aluminium profiles and speed control. From Marek Staniewski’s experience, Technical Director and board member of Amsort, we discover that most popular are earlier mentioned Belt conveyors, but also Roll Conveyors are gaining in the popularity stakes. “We receive substantially less inquiries regarding other types of conveyors (e.g. chain)” – Marek Staniewski. More then half (54%) of people surveyed answered that most popular are Bucket conveyors (transport in buckets joined by bands), especially vertical and spatial circular. Used for vertical transport of loose, grainy and fragmented products. Commonly used in different industry segments, such as building (cement, lime, gypsum) as well as food, chemical and many others. Next in the popularity ranks were link-belt conveyors (35%) built upon appropriate elements (plates, channels, carts), amongst these, most popular deemed were: lamellar, crate and roller. Lamellar conveyors are used to remove materials from hoppers, unloading bunkers and feeders. Whilst lamellar chain linked conveyors are used in ore extraction processing e.g. forging, cement, gypsum industries. Some respondents (27%) stated that for materials handling, suspended conveyors were their first choice. In this type, material is suspended on hangers and mentioned here were mainly carrying conveyors (single track). Amongst non-band conveyors the leaders are screw conveyors (69%), where transport is being conducted via a helical turning screw. In this group most popular are horizontal conveyors with rotating shaft and vertical with a rotating tube… Screw conveyors are irreplaceable in transporting powdered and dusty materials. Their main recipients are building, energy and food industries. According to 65% of respondents, deemed popular were also roll conveyors (ideal for pallet transport, carton boxes, crates, furniture boards etc.) and disc driven (horizontal transport on driven rollers or discs) especially those with individual or group drives. While 46% respondents are of the opinion, that the most popular tag for loose powdered material should be assigned to agitation type conveyors (transport through vibrations inside a chute) especially. These types are particularly useful in the chemical industry, food and as dispensers. 27% also mentioned propeller, impulse and gravity conveyors, where transport happens on non-driven rollers, discs or sliders. In active medium conveyors most readily used are pneumatic types (gaseous), which were chosen by 96% of users… Usually these are pressure type conveyors. Meanwhile more than half surveyed recognized hydraulic introverted conveyors (fluid) as the most used. Looking at Graph 2, factors deemed as paramount when choosing conveyors are mainly durability and price. End users are not satisfied with a cheap product whose quality leaves a lot to be desired. Conveyor purchase is regarded as a long term investment, whose purpose it trouble free usage. More and more are aware that price does go hand in hand with quality and durability, realizing that it is better to pay more but have years of trouble free operation. When it comes to technical parameters, 19% said that factors most important are: power, operating voltage, speed and carrying load capacity. Non-warranty servicing (42%), as well as expedient location (38%). Respondents were asked how they view quality of service and competences of their domestic conveyor suppliers. It comes to light that 81% think that their competencies are good, 12% that they are very good and only 7% state they are poor. The satisfied group favours factors such as: professional advice, comprehensive conveyor knowledge, after sales warranty and non-warranty servicing, adaptation of product to user needs, short completion time and quick delivery, product availability and high project involvement… On the other hand the non satisfied group accuse their suppliers of hindered communication, long delivery time and lack of expertise. According to Marek Staniewski from Amsort, factors such as increasing workers cost help in the development of the conveyor industry, whilst one of the factors that hinder this development, is certainly the current economic crisis. “From our point of view we haven’t noticed a decreased level of interest in conveyors, quite the opposite actually.’” Says Marek Staniewski. In the group surveyed, are there any plans on purchasing new conveyors in the next 6 months? 65% answered negatively, whilst the remainder stated that their planning on purchasing in the following months, mainly belt and screw conveyors. As can be seen in Graph 3 budgeted funds for that purpose, compared to the previous 6 months will stay the same. The reason in increased budgeting for that goal is listed as: production line expansion (57%) or line modernization (50%), wear and tare (14%), not enough conveyors (7%). “A curious and interesting solution but, nevertheless still rarely used are modular belt conveyors, on which the most spectacular operations can be conducted. Such as product rotation, separation, joining, product arranged in one row, with all of them facing the same direction. All this possible without using any automation such as sensors etc…” Marek Staniewski from Amsort explains. These modular belts can be made from various materials such as: PP (polypropylene), PE (polyethylene ), LF (acetal) and others… They can either have a closed surface area or be honey combed with different degree of openness. What is interesting is that you can attach auxiliary elements such as side limiters or sills. From Marek Staniewski’s observation, we realize that current aspirations are towards: minimizing the necessity of conservation, systems to be modular, building conveyors from eco friendly materials and lowering energy use. An example of an automated, flexible and efficient conveyor which can be used for virtually any product is one offered by Carryline. It is made out of aluminium or stainless steel and contains minimal components all chosen for their specific purpose. Respective modules are installed with the most basic accessories and tools, which makes the install or reconfiguration swift and cost effective. All Carryline components are manufactured in one location, with high stock levels being available at any given time. As a result delivery and continuos high quality levels are able to be maintained. Advanced systems of conveyors are the main element of solutions in the line production field, influencing its increased productivity and productivity of packers and users. In time higher expectations in regards to equipment tie in with greater processing and flexibility toward new products, higher productivity and lower operating costs. A great example of a conveyor which takes all these into account is the X65 by FlexLink, offering reduction in total cost of ownership (TCO), lower noise levels and innovative design, ready for future challenges. Compared to today’s standards the new X65 platform characterizes with double the power output and durability. Basically all processing plants use many different conveyors at any particular time, either in production or warehousing. It is worth remembering that an accurately chosen system for internal transport rationalizes the flow of loads and profitability. Conveyors also eliminate the need to use workers in extreme and dangerous conditions, which improves safety in the workplace. By using conveyors you not only reduce staff numbers, but expedite production and logistics processes whilst enhancing work quality and lessening product damage. Graph 3: Conveyor financial outlay in the next 6 months, as compared to previous half year. This report was prepared in 2013, based on a survey conducted with readers of Inżynieria i Utrzymanie Ruchu Zakładów Przemysłowych. Further information was obtained from conveyor producers and suppliers. This report does not highlight the whole market overview.